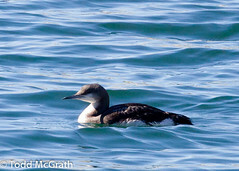 Arctic Loon at Malibu Pier – Now! Arctic Loons are extremely rare this far south on the west coast. Twenty years ago they were common, until the species was split into the Arctic and Pacific Loons. We haven’t had a real Arctic Loon here since then. It’s the Pacific Loon that’s fairly common here in the winter. So it’s a big deal when one show up, as one did (and still is) by the Malibu Pier last Saturday, Jan. 12. Photos are still being studied, but consensus among local birders seems to lean very strongly towards calling it an Arctic. Todd had this to say about the bird: The size and structure of the bird favored Arctic, and the flank patches were present on both sides, and appeared to be the proper shape. The bird looked like a worn Juv, which may explain the faded look to the back of the head. The bill looked a little on the smaller side to me, although comparing the photos it looks in the ballpark for Arctic. I look forward to hearing the opinion of others on this interesting bird. The bird was discovered when local birding expert Gene Cardiff was leading his UC Riverside Winter Birds Class at Malibu Pier. Class member Kyri Freeman was apparently the first to suggest that it might be an Arctic. I am including a copy of Kyri’s report which Kimball Garrett posted today on LACoBirds. I think it is an excellent example of the kind of thought process and observations that a good birder goes through when dealing with a difficult identification. Guidebooks were gotten out, and we noted that this bird did not have a chinstrap, but that does not eliminate a young Pacific Loon. Gene Cardiff felt that the bill looked heavier/longer than on a Pacific, in keeping with my feeling it looked just like the SCBC pictures, but that would not be diagnostic without a Pacific right there to compare, I don’t think. We also noted the warning in the Nat Geo guide that Pacific “can show some white” on the flank. At this point we were looking down on the bird and could not see how far above the waterline the white extended. The bird then hid under the pier for the next hour or so. After walking back down the beach to observe the low tide changes, we came back to the pier area and saw the loon very close to the beach, maybe 15 feet off shore. At this point, we had a side view and saw that the white flanks curved upward in a half-circle, well above water line, both when the bird was swimming and when it flapped its wings. At this point, Gene said we had confirmed it as an Arctic Loon. It didn’t vocalize at any point. I thought its coming so close to shore and its confiding behavior seemed unusual, but don’t know if that is of any significance. David Bell supplies an additional photo as well as a video of the bird bobbing about on the water. Difficult identifications depend on an assembly of details. You notice something odd. Check out that detail in a field guide if you have one. Often the guide will suggest something else to look for. Check that out. Don’t rely on a single field mark to nail it down. Kimball Garrett passed along these comments from Todd and David as they were photographing the bird: Good Arctic characters include: consistent white flank patches, apparently large overall size, Arctic head shape (less rounded than Pacific), lack of chinstrap. However, the bill doesn’t look exceptionally large (but maybe within the range of female Arctic?) and the hindneck is paler than normally seen on Arctic (variable?). The bird is a juvenile, but not as heavily patterned on the upperparts as the bird currently in Monterey. Additional Photo & Video from Chris Taylor: On 1/15/13 Chris posted this video of the bird. It bobs so buoyantly in the water I would think it was a cork decoy were it not for its constant looking around. He also has a really good photo here. Warning to the unwary: I find looking at Chris’ photos just a bit depressing because they are so astronomically better than mine. I suggest that you get out your field guides, look at the various pictures, watch the videos, and figure out why other birders think it’s an Arctic and not a Pacific Loon, and whether you agree with them or not. Congratulations to the finders and photographers.